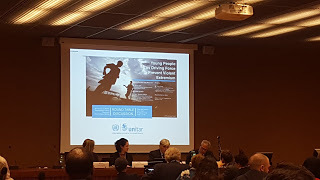 On 20 October 2016, the United Nations Institute for Training and Research (UNITAR) hosted the panel discussion, “Young People as a Driving Force to Prevent Violent Extremism.” The panel discussed the capacity of young people to be drivers of positive change and leadership, particularly for youth in fragile settings. The speakers included retired Lieutenant General Romeo Dallaire, Amanda Fazzone, Senior Countering Violent Extremism Officer of global Community Engagement and Resilience Fund (GCERF), and trained psychologist Dr. Ellis. UNITAR executive Nikhil Seth moderated the event that took place in Room XXIII in the Palais des Nations. With over half of the global population under 30, youth can bring about change in a positive way given the right conditions and support structures. Of concern are the youth who have been victims of armed conflicts, natural disasters or other socio-political events beyond their control. However, given the right support and development opportunities, these children can be swayed away from a path of violent extremism and instead be positive drivers for their society. The panelists discussed how former child soldiers or other children who are victims from armed conflict can be rehabilitated given the right education and learning environment. However, these children need to receive proper psychological care to overcome their traumatic experiences before integrating themselves into society. The risk of these children going towards a path of violent extremism can be countered if a holistic approach is applied to strengthening their physical, economic, and emotional security. Grants from organizations like GCERF help fund projects administered by local level communities to help empower and build leadership capacity for young people. However, there was an emphasis by the panelists for private sector and NGO engagement to help these youth who require proper mentorship, employment opportunities, psychological care and quality education. In conclusion, the panelists agreed that the youth of today have the capacity to help other young people institute positive change through different means such as civic and political participation, international volunteerism or engagement with NGOs. The future may look uncertain for youth in some parts of the world, but if given the right purpose and support, they can be the driving force needed to enact positive change and overcome violent extremism.